This post has been adapted since it first appeared on everyday-thoughts.com in 2014. After having baby #2 the learning continues so it only seems appropriate that I update this so you can learn some of my mistakes. My big man and I have been trapped in the house sick for the last two days. The baby has a fever and the nasty stomach bug and I've been congested and nauseous. I'm not a nurse or a doctor and I didn't grow up around children so needless to say, these past few days I've learned a couple things about caring for a sick little one. Don't be intimidated to call a doctor or nurse helpline. I've heard all the stories about first-time parents that call doctors for "medical emergencies" that end up amounting to little more than the common cold. I also developed a phobia of calling the doctor for fear of being labeled one of those "crazy" parents that freak out about every ailment. So I consciously made the decision not to call the nurse help line unless it was an absolute emergency. Well, that's was a mistake. Who cares what other parents think of you? Those helplines are there for a reason and if you aren't a pediatric doctor or nurse, chances are the people answering your call just might be in a position to provide you with advice. Take it. If they don't want the calls from "crazy" parents then they need to rethink their careers. A warm bath and a cold cloth can work miracles. When you have a child with a fever sometimes the best treatment is a warm bath. 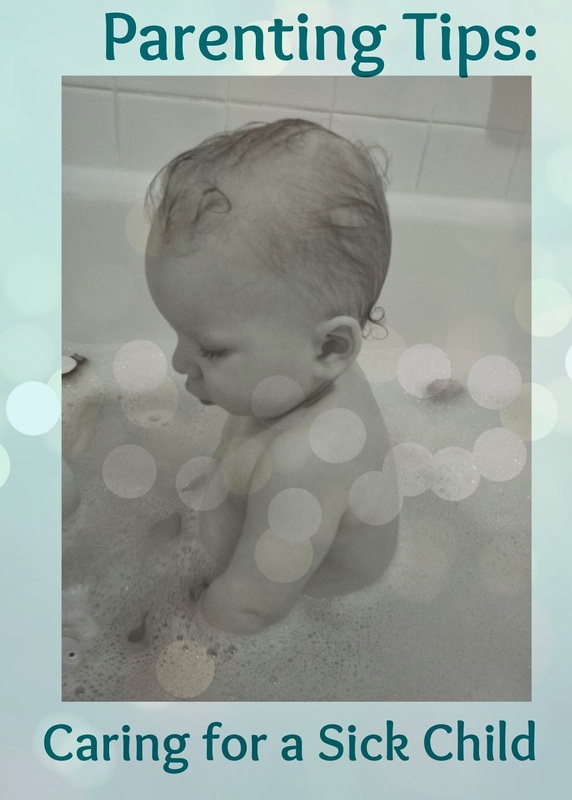 Add a couple bubbles or some Lavender Essential Oil and let your little one relax. When a bath isn't an option try a cool cloth on their hand to help bring down their temperature. Something I've learned in the past three years - if a bath is too hot it will actually cause the fever to spike when the little one gets out so take caution that the bath is warm - not hot. If you don't want to take your chances with a bath you can create a steam room by running extra hot water in the shower and closing all the windows and doors. You sit outside the shower, so you aren't getting wet, and just relax with your little. This should help break up any mucous and alleviate sinus problems. (Bonus - it's also great for your skin). Take their temperatures and keep a log for 24 hours. Most pediatricians say that you really shouldn't worry about a little one's temperature unless it's over 104 degrees. Man doesn't that seem high?! Make sure you are properly taking your little's temperature (in most case rectually) - I think the best type of thermometer is the just a straight-forward digital thermometer like this one. Take pictures and keep notes. The moment you recognize that your little one isn't feeling well start tracking your little's food and drink consumption, bowel movements, any medication you might give them, and take notes about anything irregular. Like the old says goes, "a picture's worth 1000 words." So bust out your smartphone and snap away. It could be incredibly beneficial when, and if, you need to speak to a doctor or nurse. I've also found that some doctors and nurses even allow you to text pictures to them for immediate assistance. Keep a good humidifier on hand. Whenever my littles start to get sick my first response is to try a cool mist humidifier. I've gone through 5-6 different varieties of humidifiers and I finally found one that I love, the Vicks 1.0 Gallon Cool Mist Humidifier. It doesn't make much noise, it puts out a huge amount of mist and with very little care it is easy to maintain. Hydrate, hydrate, hydrate. One of the primary reasons little ones are admitted to hospital when they're sick is because of dehydration. Make sure to fill your little one with fluids when they're not feeling well. If they won't take water or Pedialyte try filling up a medicine syringe with a couple teaspoons of water. Lay them on their back and giving it to them that way. They might fight you but it's better than being admitted to the hospital. Trust your gut. You're the parent and no one knows your child like you do. Trust your intuition. If you think something is wrong, you're probably correct. Do you have any helpful hints to first-time parents dealing with sick little ones? I'm obviously not a mom yet- but these are great tips! I feel like I'm going to be that mom that worries ALL the time but will feel nervous about calling for help. Thanks Margaret. It's difficult to remember to put your own insecurities aside for the sake of your little one but I know when the time comes you'll be great at it. I've been sooooo lucky that my little guy has not been sick yet and he is 11 months old. But I'm a worrier and am always watching for signs haha!! I know my day will come and I'm sure I'll be heartbroken when I'm trying to nurse my little sweetheart back to health!